This post is a part of the Virtual Advent Tour. Thank you, SpriteWrites, for allowing me to once again be a part of this fantastic blogging tradition. 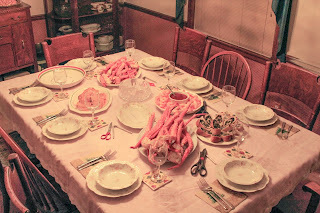 The following is an excerpt from my newest book, Italian Family Christmas. The Feast of Seven Fishes is the traditional Christmas Eve meal of southern Italy. The religious significance of this feast is deeply rooted in Roman Catholic tradition. Each of the seven fish courses relates to the holy sacraments. A modified three-course version represents the Holy Trinity. My husband grew up in the Northeast, where there is a large Italian population. Finding authentic ingredients was as convenient as a trip to the neighborhood deli. Finding these necessary Italian groceries is not as easy in Kansas City. I can usually locate staples such as anchovies and ricotta, but Baccala remains elusive. Baccala is the traditional salted cod served at the Christmas Eve Vigil. The first time I inquired at the local supermarket, I was met with blank stares. We have tilapia they offered. Not nearly the same. I started the search in early November, but I knew by the middle of the month I was not going to find any in the KC Metro. We arranged for Geoff’s family to visit us for the holidays. Since it was our first year away from family, I wanted to learn from Cora herself how to make the vigil. And I was desperate to have the Baccala in-house for her arrival. Timing is essential when purchasing Baccala. Since salt is the preservative for the fish, it doesn’t require refrigeration. However, the salt makes the fish rock hard. In order to prepare the fish for eating, it must soak in water for several days. First, the baccala is placed in a large pot of tepid water. It soaks for about twelve hours, and then the water is drained. Fresh water is added and the soaking begins again. After about six soaks and rinses, the fish is pliable and ready to use. By December I had not yet located the fish. Time was running out for our first vigil dinner, and we were only days away from Christmas Eve. What could we do? Geoff’s grandmother, Cora, offered to buy the Baccala at her local Italian grocer in Bridgeport. 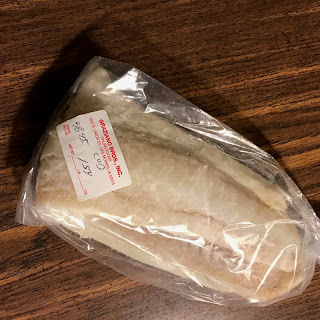 She then wrapped the fish in butcher paper, and again in plastic wrap, and sent it to us via Express Mail. I received the fish by December 20th – plenty of time to soak for the Christmas Eve dinner. This fish-through-the-mail story is now legendary in our Midwest neighborhood. While I do see the humor, it is also a testimony to the importance of maintaining family heritage. 1. Measure Bisquick™ into a large bowl. 3. Mix together until just blended. 4. Stir in the flaked baccala (flaking baccala uses the same technique as pulling pork with a fork). 5. Fry in small batches (about four at a time) in a bit of vegetable oil – until golden brown on both sides. 6. 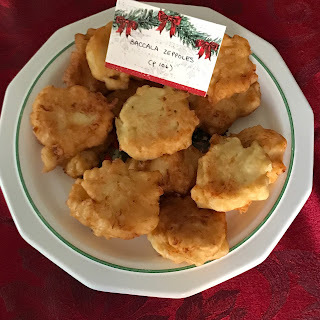 Keep zeppoles in low-heat oven while others are frying. Makes enough zeppoles to easily feed a family of 10-12. 1. The baccala needs to soak – to draw out the salt and make it pliable. 2. Fill a large pot with water – enough to entirely cover the baccala. 3. Let sit for 12 hours… drain the salted water … add fresh water… and soak again. 4. Repeat the process for 2-3 days – until the water runs clear and the fish is soft yet firm. The book “Cod” by Mark Kurlansky traces the history of this traditional shelf-stable fish product used in so many different cultures. You didn’t mention how you get it now: out of curiosity I googled it, and immediately found several offers for online ordering. I don’t know when your story dates from, but things really are different since online shopping became possible. I hope your Italian Christmas celebration is wonderful this year! Merry Christmas, Molly! Love the story about Cora coming to the rescue. Family traditions are indeed important. I've never made salt cod, but I think I've seen it at Wegmans. Merry Christmas to you too, Candace! I didn't know you were in St.Louis. I grew up there.